Past weather has always had more rainy days, or fewer, hotter or cooler temperatures, more frequent intense storms and more or less severe weather. This is how the world works and always has. But, you might say, the Sahara desert has been a desert with hot days, cold nights and only occasional rain since records began. This is true. Some places seem to have stable weather but, like most of the difficult climate change effects, it is a question of timescale. We cannot go back to see what the weather was like in the past but we can understand some of the consequences. In the 1850’s when David Livingstone began searching in Africa for the source of the Nile river he came across Lake Ngami in what is now northern Botswana. The lake was full. 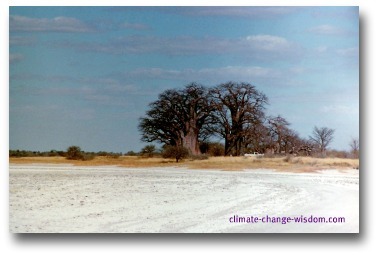 Today it is dry and has been for most of the past hundred years because water from the Okavango no longer reaches the inflow. 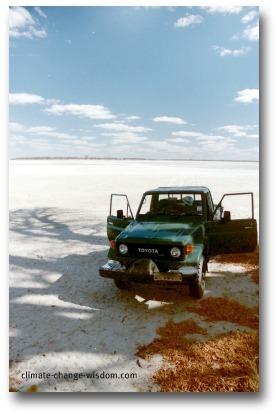 Southeast of Lake Ngami lie the Magadigadi Pans, flat saltpans that are bone dry for most of the year but fill to a shallow depth if the summer rains are plentiful. Brine shrimp thrive in these conditions and provide food for thousands of flamingos. Evidence from archeological studies of raised beaches shows that these seasonal pans used to be large inland lakes with water deep and permanent enough for fish sufficient to sustain human habitation on its shores. 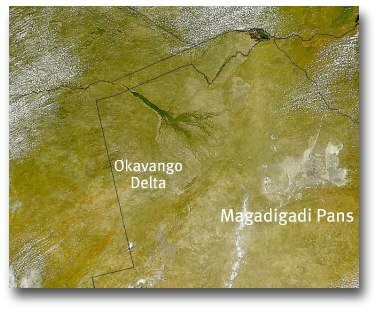 The satellite image shows how the pans were once connected as one large inland lake. The weather then would have been much wetter, more humid and with less extreme heat and cold when the lake was full of water. Go back far enough in time and past weather will be different to the weather now because the Earth’s climate system is in constant flux, local landscapes change and continents drift across the surface if the globe. Our planet is a dynamic place. Unfortunately given our concerns over climate change effects and global warming effects past weather is no predictor of future weather. So even when we can understand what the weather used to be it does not help us with what might be coming next. A characteristic that we all share is a desire for constancy. We like stability and a predictability to things around us. It is in our genes. Only change is everywhere and always has been part of daily living. Our activities have even contributed to it. We may prefer the weather in the past but it is gone as part of that change.